Fireman’s Arms welcomes you with the ambiance of an old English pub; the dark, rich polished wooden bars and tables, memorabilia such as fireman’s helmets, an old ladder, a fireman’s pole, and snippets from sport history, make you think back to a time of old. 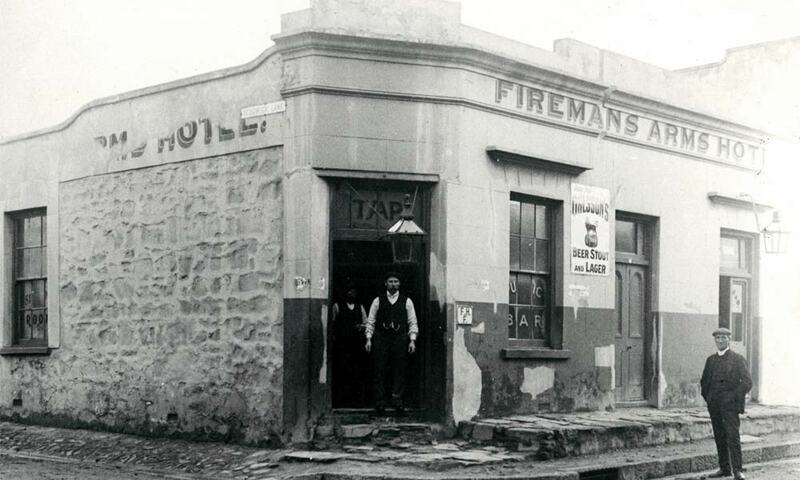 Established in 1864, the proudly South African pub has moved along with the times, keeping the original building to create a historic hotspot that serves as a haven for locals and tourist alike. With a setting that is anything but contemporary, Fireman’s Arms provides excellent service in a sanctuary that offers relaxation, satiates thirst with a variety of beverages and fills the hungry, with a selection of mouth watering meals. It may be one of the oldest pubs around, but brings the best in sport with state-of-the-art tech, in high definition, with excellent sound. The venue is fitted with 9 x 46” flat screen panels as well as two big screens to ensure you get the best of every game. Fireman’s Arms is alive when it comes to sport, watch everything from the Rugby World Cup, the Formula 1 Grand Prix and tennis to European League Football. The bigger the game, the better the vibe; mingle with regulars, as you support your favourite team. If you ever find yourself in need of refreshment, come to Fireman’s Arms, come thirsty. We have a selection of more than 25 beers on tap, great specials and a large variety of beverages which include speciality coffees. Indulge your beer addiction, who knows it might help you pluck up the courage to climb to the top of our fireman’s pole to leave your mark, as you sign the ceiling. What’s a good pub without some grub? We turn up the heat with blazing, hearty meals that hit the spot. Our homemade pies are in a class of their own. The Fireman’s Pie is strictly for the brave, it doesn’t get hotter than this. Fill the hole in your tummy with starters, foccacia, homemade soups, salads, mains that range from steak, to pies, curry, fish and chips and pizza. Why not try out our thin gluten free pizza base? Get creative with a range of decadent toppings including escargot. Whatever you end up having, leave room for dessert! Thursday nights serve as a combination of entertainment, drinks, good food and an opportunity to participate in the battle of brains, as you test your trivia knowledge in a pub quiz hosted by Quiz Nites Cape Town. Phuza Thursday just got better! Whether you’re having a hectic Monday and need some uplifting, you need a cosy spot to read the paper or you’re on a lunch break and want to catch up on sport, Fireman’s Arm’s welcomes you. Pop in and say hi! Our place is so homely, even two cats have made it their home. Don’t forget to post your photos of every good time at Fireman’s Arms on our Instagram and tag #FiremansArms. Keep an eye on your favourite sports and take a look at our menu when you visit our website, Facebook page, Twitter and Google+ page.